City Parks Foundation is pleased to announce our 2018 Gala dinner & concert. 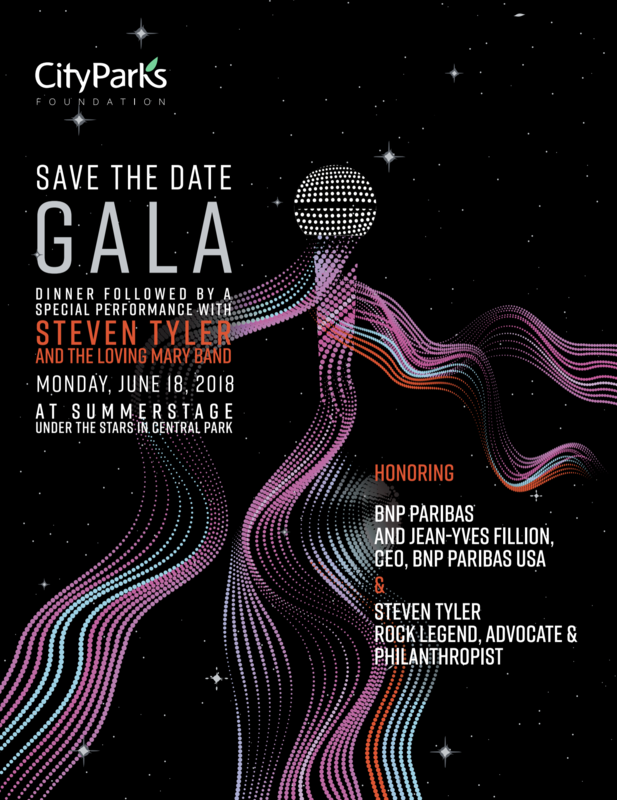 This year we proudly honor BNP Paribas and Jean-Yves Fillion, Chief Executive Officer of BNP Paribas USA, and rock legend Steven Tyler. Following the dinner, guests will enjoy a SummerStage concert performed by Steven Tyler and The Loving Mary Band. Limited Cocktails & Concert only tickets available! City Parks Foundation is proud to honor BNP Paribas with Jean-Yves Fillion, CEO, BNP Paribas USA and Chairman, CIB Americas, with the “People and Parks” Award. Under Jean Yves Fillion’s leadership, BNP Paribas USA has been a major participant in our Partnerships for Parks program, sending hundreds of employee volunteers each year to help us improve parks throughout New York City. BNP is also a major supporter of CityParks Tennis, which provides free instruction and competitive opportunities for over 6,000 children annually in 38 parks. City Parks Foundation is thrilled to present Steven Tyler with our inaugural “SummerStage Icon” Award, for his enormous contributions to our city’s — and our country’s — cultural landscape, and for his tireless efforts as an avid advocate and philanthropist. A native New Yorker, rock icon Steven Tyler has performed some of rock and roll’s greatest hits including “Dream On”, “Sweet Emotion”, “Cryin’”, and “Janie’s Got a Gun”. Tyler is a member of the Rock and Roll Hall of Fame, the Songwriters Hall of Fame, is a multi-Grammy Award winner, and is considered by Rolling Stone to be one of the 100 Greatest Singers. In 2016, Tyler received the United Nations Humanitarian Award for his work bringing hope and healing to girls who have suffered the trauma of abuse and neglect. Tyler is deeply committed to protecting the rights of songwriters and is a tireless advocate for raising awareness of addiction issues and recovery solutions. This incredible evening under the stars raises funds needed to support City Parks Foundation’s free arts, sports, education, and community-building programs held in parks throughout NYC. Includes VIP front & center seating for twelve (12) for dinner and concert; VIP Backstage Passes; Recognition from the stage; On-screen recognition during dinner; Star Sapphire listing in printed program. Includes premier seating for twelve (12) for dinner and concert; VIP Backstage Passes; On-screen recognition during dinner; Diamond listing in printed program. Includes priority seating for ten (10) for dinner and concert; On-screen recognition during dinner; Platinum listing in printed program. Includes seating for four (4) for dinner and concert; VIP Backstage Passes; On-screen recognition during dinner. Gold listing in printed program. Includes seating for one (1) for dinner and concert. Includes pre-show cocktail hour with full open bar. Concert seating for one (1) at reserved table with wine & bar bites. Limited availability. Commitments of $1,000 or more that are received by Friday, April 6, 2018 will be listed on the invitation. Contact Meagan Butler for additional information and to attend 212.360.8185 or events@cityparksfoundation.org.